The view of Machu Picchu !!! After falling ill the night before the trek, I was devastated to miss out. However, I did manage to meet up with the group at the Sun Gate on the final day, thanks to Inca Trail Reservations helping with alternate arrangements. I Had a wonderful time doing the Salkantay . I met great people, and spent 5 awesome days. The trek had beutiful view .You start in the mountain, walk near the glaciers and end in the jungle . The Salkantay trek we did was incredibly organised and full of entertainment. From challenging walks that ended in glacier lakes (that me and my girlfriend swam in!) to the option of horseback riding up/down mountains and always with incredible views. The guides for our trip were excellent. They were very informative, friendly, had a good sense of humour and helped me alot when I was ill.
First of all the Machu Picchu trip was awesome !. The way travel agency planed was helpful in many ways. Every time they were punctual and very nice, all the guides were very knowledgeable and kind. I conquered the Inca trail! This trip was a very special one for me.This year is my wife's and my 30th year anniversary. I have been waiting for doing this trail for many years and was very happy that I was finally able to do this trail this trip with my husband. 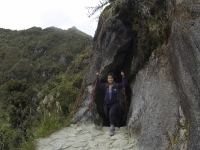 The Inca Trail trip was one of my bucket list and finally I made thanks to Inca Trail Reservations Travel Agency. This was the most extraordinary experience of my life so far. Challenging yet completely full filing and sublime. The Adventure vacation I will call it, right from the beginning the tour guides were so friendly,knowledgeable, made us feel like family. Fueran las vacaciones mas ricas de toda mi vida. Visiting Machu Picchu has been something I've wanted to do for as long as I can remember. I just fulfilled my wife's bucket list! Took the trip without preparing for it but I survived and made it to the top of the dead woman's pass and down to the city of Machu Pichu. The trip made me discern again aout life, love and friendship and family. It made me appreciate the life thet i have.